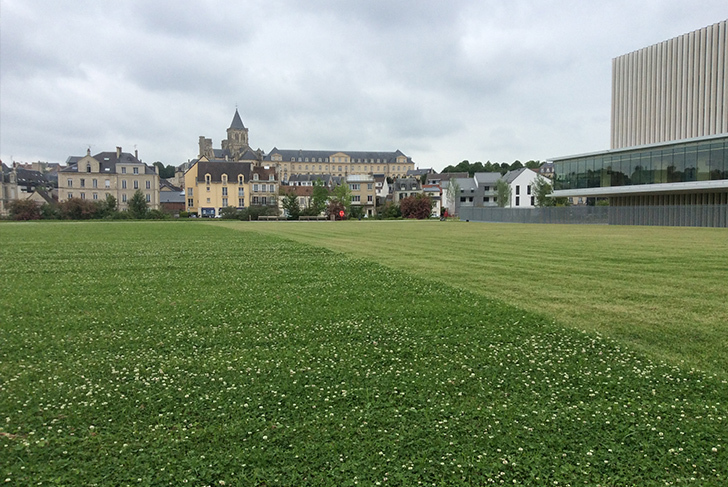 The lawn that we created in the centre of the île de Caen is elementary. But it fascinates me nonetheless. This lawn is an inheritance: Philippe Panerai plotted it out during his work for the port peninsula. Vast triangle that opens the view north towards the Abbaye aux Dames, this major public space functions, already in its prior imagining, in setting the boundaries for the constructible blocks that surround it. Despite the fact that the overall plan has been generally disrupted by the construction of two public buildings with an intriguing scale, and despite the fact that the buildings to be built nearby in the near future are unknown, we made the choice to rigorously introduce this lawn into the area. It is by now common practice to regard voids or empty spaces as precious commodities in urban development plans. But sometimes, from the point of view of the architect, these voids take on the ambiguous status of “unbuilt space”. For this reason, public space in general, in its form as city squares, gardens, and even at times as agricultural areas, can be approached as a void. Many architects and landscape architects before us proposed significant tree plantings for the heart of the île de Caen as well as different hypotheses for the recomposition of the area. On occasion, I was tempted to set up a number of groves as a conservatory measure, concerned about the various confrontations with the buildings to come. Nonetheless, we have completely and rigorously brought this lawn to realization. And I like the excessiveness and disproportion that results: the total absence of elements that would otherwise provide referential scale places the large buildings of the site into a spatial situation that delights me. Beforehand, I was concerned about the potential spatial confrontations that the lawn would create, but the abstraction of the empty space brings about an unforeseen unity, imparting to each object the same status. A beauty here similar to that evoked by certain collages of architects where the buildings of a neighborhood are cut out and placed on a white sheet, or to that beauty found in certain museum catalogues where a varied group of objects are brought together outside any context but with, nonetheless, unsuspected resonances and coherences between them. It becomes indeed a question of implementation and rigor. But such a lawn can as well bring to mind the original poverty of the green spaces found in residential developments. But this poverty was the result of a process by default: a process that lacked means and design. The île de Caen lawn is an architecture. The work is rudimentary although such a claim can appear unsatisfactory. Yet I believe we reached the critical threshold of this essence by extending a perfect horizontal from one side to the other. The horizontal is not a normal or natural solution for these embankment areas of irregular shape where buildings and streets have existed for decades. And it was also in contradiction with certain reflexes of the profession that we decided to willfully start from a clean slate. For it is indeed the artifice inherent in this leveling or grading process which lends abstraction and a sense of excessiveness to this modest public space. Through the creation of the lawn in such a way, it becomes neither green space, nor part of a park, nor a compulsory reminder of a meadow from the past. I recall that Michel Corajoud admired the lawns of Annecy and the Plain Palet in Geneva before its recent transformation into an esplanade. I also recall his obsession, which we used to judge formalist, for layouts and leveling. It is nonetheless this kind of attention, costly considering the size of the site, which lends to this inherited lawn its status and essence. Large lawn and small, inoffensive tabula rasa. If one thinks about some of the terraces that Le Nôtre knew how to set up along ridge lines in Meudon and Saint Germain – a much more spectacular feat than our installation along the hollow of a valley – some obvious facts come to mind: these architectures revive, amplify, enhance, and transcend the natural geography of the Seine valley. It could be supposed that no site commission today would authorize the construction of these architectures, and that all kinds of defenders of the landscape would denounce them as a profanation and causing a loss of identity. Nonetheless, they appear to us precisely and powerfully situated and unique to their location. If Versailles is at the heart of the invention of the classical city, as Panerai and Castex have written, it is thanks to the work of Le Nôtre, who interiorized and rendered artistic the large hunting layout of the Versailles plain within the enclosure of the Versailles Park. A layouts that served in its turn, through a sort of mirror effect brought about by its relation to the Château, as the matrix for the forms of the surrounding city. I like to consider Versailles not the result of the projection of a model upon a territory, but rather as the revelation and sublimation of the singularities of a territory. It could be said that, contrary to all appearances, Versailles is a custom-built city and I like to think that the architecture of its gardens is accessible to many. On the other side of the Atlantic, certain park systems from the end of the 19th Century appear just as equally based upon the invention of singularity, forming a basis for urban forms. These are the prerequisites for other custom-built cities where everything tends towards the revelation of the natural geography, and in consequence, upon the artificial amplification of this rediscovered geography. It is here again a question of architecture, of the ability to transcend singularities. Of course, we need to remain attentive to ecological continuities. Naturally we are curious about the traces left to us by history. But above all, I am convinced that the rigor of an architectural work can create the conditions for the emergence of a custom-built city.